...like my morning espresso in my favorite cup and chocolate-dipped biscotti on the side. There were a few vacation highlights... It started off well on Friday night, with dinner out, to one of the best restaurants in town, with my parents and brother to celebrate my mom's birthday. We had fun plus the special I tried was delicious! 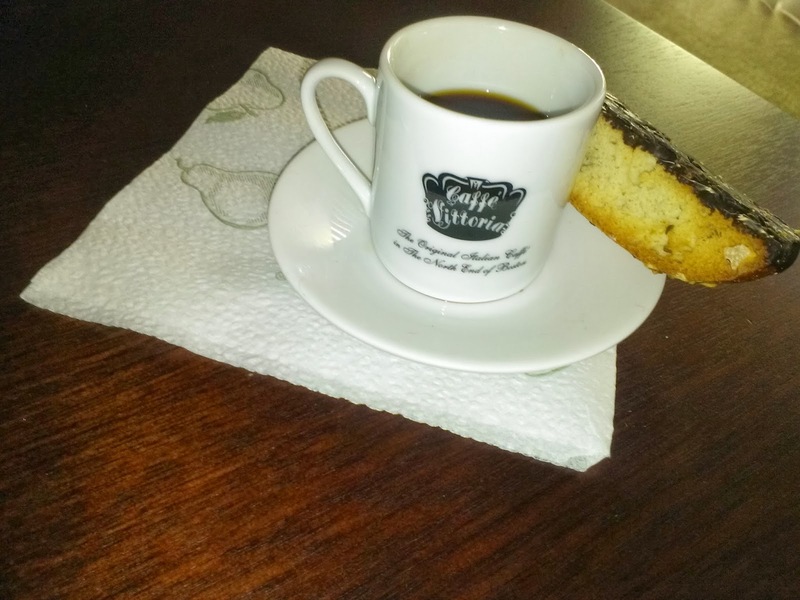 On Monday afternoon, Kate of Une Vie Chic and I had coffee at my favorite coffee shop, did a little antique shopping and overall indulged in some girl time. (Read about my find from antiquing on this Sunday's style post.) I've been watching How I Met Your Mother online on Tuesday morning since I don't have a TV to catch it Monday night. I also accomplished a lot of what I've been procrastinating about lately during Tuesday morning, but I'd rather write about the things I want to do than those I have to do. I spontaneously watched a highly anticipated movie Tuesday evening. (I love my Kindle!) It was the one I tried to drive to in June when my car first started breaking down. It's Before Midnight, which is the third and final chapter of a trilogy, following the films entitled Before Sunrise and Before Sunset. Have you seen these? In Before Sunrise, Jesse and Celine meet on a train and decide to get off in Vienna together. The movie is just them walking around the city talking, falling in love. At the end, they decide to meet there in six months. I felt sure that they'd meet! You find out in the next installment, Before Sunset, that they didn't. Jesse wrote a book about it years later and while promoting his book in Paris, they meet again and stroll around Paris and end up at her apartment instead of Jesse heading for the airport. He's married and has a son back in America. 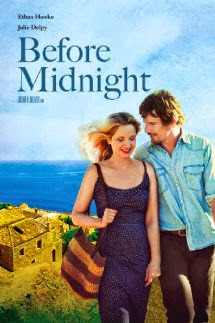 The viewer finds out in last part of the trilogy, Before Midnight, that they stayed together and have twin girls. They have a lot of issues in their relationship like where they live, if they're close in geography to his son, her feminist nature being forced into a submissive role of wife and mother. You get a peak in at their lives as they stroll around a Greek town and in a hotel room their friends treated them to. I thought the third one would be incredible ...and it was. This one offers something different than the other two charming love stories because of its reality, it's about relationships. Their major fight scene even made me feel uncomfortable, despite some comic relief, but that's just how affecting these movies are... how intensely the characters are developed and how wonderful Ethan Hawke and Julie Delpy perform. You root for them. I really think these two (...fictional characters...) will stay together! The movie's not always so dramatic as I have hinted, it's hilarious too. These movies are not for everyone; they're all dialogue! And the third contains a lot of conflict which I do not like myself! Still, it kept my interest and overall, I really enjoyed the series. Grazie to B who introduced me to Before Sunrise in college.